Ikingura, J.K.B. 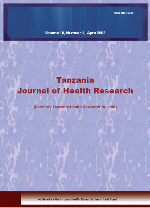 ; Kruger, M. & Zeleke, W.
This study was undertaken to describe the performance of health research ethics review procedures of six research centres in Tanzania. Data collection was done through a self-administered questionnaire and personal interviews. The results showed that there were on average 11 members (range= 8-14) in each Research Ethic Committee. However, female representation in the committees was low (15.2%). The largest proportion of the committee members was biomedical scientists (51.5%). Others included medical doctors (19.7%), social scientists (7.6%), laboratory technologists (10.6%), religious leaders (4.5%), statisticians (3.0%), teachers (1.5%) and lawyers (1.5). Committee members had different capacities to carry out review of research proposals (no capacity=2%; limited capacity=15%; moderate capacity=20%; good capacity=48%, excellent capacity=13%). Only half of the respondents had prior ethics review training. Although the majority deemed that ethical guidelines were very important (66%), there were challenges in the use of ethical guidelines which included lack of awareness on the national accreditation mechanisms for ethics committee (59%). Adherence to ethical principles and regulations was influenced by being a scientist (OR= 42.47), being an employee of a professional organization (OR= 15.25), and having an interests in the use of ethical guidelines (OR= 10.85) These findings indicate the need for capacity strengthening (through training and resource support), inclusion of more female representation and other mandatory professions to the research ethics committees.